When you think of international trade, you might imagine a bunch of countries shaking hands while goods and services flow between them. It’s easy to forget that although governments play a role in international trade, it is the private corporations which are doing the legwork to make sure the demands of the world economy are met. Before any international business can be done, there first needs to be exchange of documents between the parties in each country. Any Canadian document that needs to be used outside of Canada needs to go through a process of verification. The reason this process is required is simple: to ensure that any given document is valid. If you were to take your Canadian Incorporation Document, Pharmaceutical Document, or Corporate Power of Attorney to a country like the UAE, Qatar, Mexico, or Germany, they would have no way of knowing if your Canadian document is real or fake. Even if it was notarized, there would be no way of knowing for sure that you didn’t simply put it together in your basement on a fancy sheet of paper with a high-tech printer. As such, a verification process is required to ensure any Canadian document that is going to be used overseas is legitimate. This process has many names depending on the country and can include terms such as Attestation, Apostille, Superlegalization, or simply Authentication. Attestation and Apostille are probably the most common as most Middle Eastern countries use the Attestation process and over 100 countries use the Apostille process, including all of Europe and South America. However, Canada has not signed the Hague Apostille convention. Instead, Canada uses the original two step process that was used by current Apostille countries prior to the convention. This process is called authentication and legalization and it is legally equal to an Apostille. The first step takes place at Global Affairs Canada here in Ottawa. The second step takes place at the appropriate embassy or consulate of the country in which you will be using your corporate documents. In short, if you are a Canadian company and the requesting party overseas instructs you to get an Apostille, you will actually need authentication at Global Affairs Canada and legalization at the appropriate embassy since Canada does not use the Apostille. 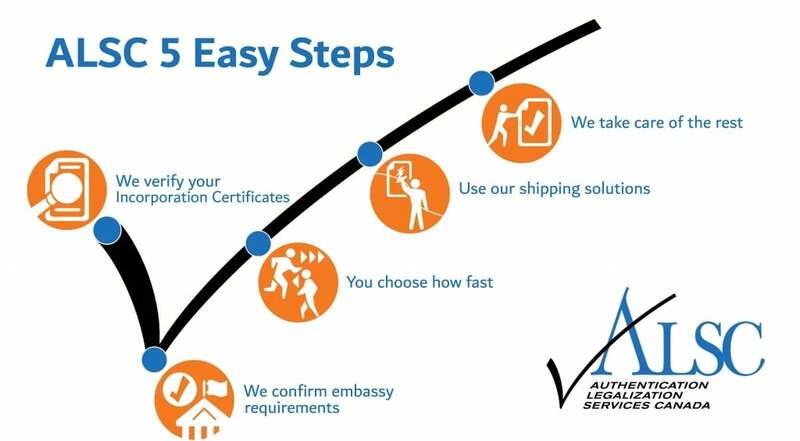 Again, this two step process is equivalent to an Apostille so your Canadian documents will be legally valid for use in the destination country of your choice once they been authenticated and legalized. This is the service we have proudly provided for over 25 years. Finally, there are some exceptions to this rule, such as the United Kingdom. There are also some smaller countries which do not even offer legalization services in Canada. If you have Canadian corporate documents which you need to use in the United Kingdom, Andorra, Namibia, Botswana, Antigua and Barbuda, or any other nation which falls under the commonwealth, then please contact us for assistance. Once you have had your Canadian corporate documents authenticated and legalized for foreign use, there is a possibility that you will still need to go through further processes in the destination country. These can simply be whatever corporate processes your requesting parties will have to go through, but they can also include additional steps to validate your documents. For example, countries such as Honduras and Colombia require that your documents be stamped by their respective Foreign Affairs Ministries in country. This is in addition to the Canadian authentication and legalization process. Furthermore, it is common that your Canadian corporate documents will need to be translated into one of the national languages of the destination country. These language requirements can vary substantially and are not always required to be accepted overseas. In the cases where translations are required, it is usually preferable to have the translations done in the destination country rather than in Canada. This is not only because it is usually more cost effective to do, but because it will also protect against unnecessary expenses should the documents required for processing change. 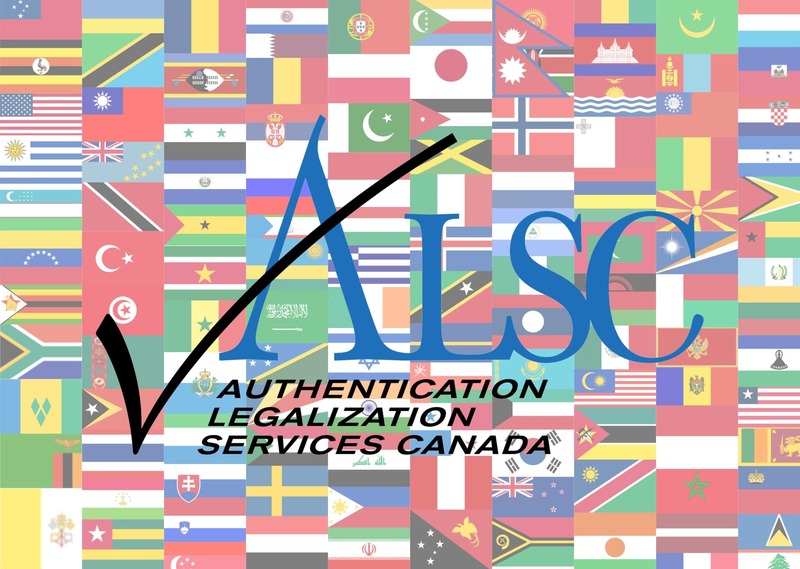 Although we are only able to assist with the initial authentication and legalization process here in Canada, we can advise as to when you will need to have your Canadian corporate documents further verified at the Foreign Affairs Ministry overseas, as well as when there are language requirements for your documents. For any inquiries beyond this you will need to contact your affiliates abroad as well as the appropriate legal authorities in the destination country. Canadian Certificates of Pharmaceutical Products, or CPPs for short, are some of the easier corporate documents to process for use overseas. This is because many pharmaceutical documents are issued by government authorities such as Health Canada, and therefore contain signatures that are recognized by staff at Global Affairs Canada. These are commonly required to register a new pharmaceutical product overseas, or to modify the status of an existing product. If you already have this document in your possession then it is ready for processing. If you do not yet have this document, you can follow the steps detailed here. Note that it is common for these documents to be accompanied by other Health Canada documents or Consumer Health Canada documents such as Good Manufacturing Practice certificates (GMPs), International Trade Certificates (ITCs), Medical Device Licenses (MDL) and Establishment Licenses. Make sure to double check with the appropriate requesting party overseas as to which of these documents you will require, and whether they will need originals or if notarized copies of these documents will suffice. Any incorporation documents will require notarization by a lawyer or notary public. You may already have notarized copies of these documents on file ready to go, or have easy access to a notary who can draft these documents for you at a moments notice. Once notarized, it is always important to check that the notary has placed his or her stamp, seal, and signature on the document. Although uncommon, this error has been known to cause significant delays in this process as Global Affairs Canada will not authenticate any corporate documents which have not been properly notarized, or if there are discrepancies between the notary seal and signature. You may be unsure whether notarized copies of your incorporation documents will suffice. You should always double check with the requesting party as to exactly what documents they will accept for their processes. Unfortunately we cannot advise on this matter. If you need to get your articles of amendment or articles of amalgamation, you can start by filling out the forms found by clicking here. If you need a Canadian commercial invoice or certificate of origin for use overseas you can use the “TradeCert – Certification Made Simple” service offered by the Canadian Chamber of Commerce to certify these documents. Signatures from select staff at the Canadian Chamber of Commerce are recognized by Global Affairs Canada. This makes any documents signed by the Canadian Chamber of Commerce ready for authentication upon issuance. However, note that there might be additional notarization requirements for any Commercial Invoice you need to use overseas. This is due to recent changes in requirements at Global Affairs Canada. Once you have confirmed use of our services we can guide you through these new requirements to ensure your Commercial Invoices and Certificates of Origin are ready for use outside of Canada. Corporate powers of attorney are some of the most common documents used in the business world. Canadian Corporate Powers of Attorney that need to be used overseas will first need to be notarized by a Canadian lawyer or notary public to be valid for authentication at Global Affairs Canada. This step is typically required for powers of attorney to be used within Canada, so it is likely that you already have your Canadian corporate power of attorney ready for processing outside of Canada. If your corporate power of attorney contains a language that is not English or French, there will be some additional requirements you will need to provide to have them authenticated at Global Affairs Canada. Similarly, depending on which country you will be using your Canadian corporate power of attorney in, you will need to provide some extensive requirements to validate the identities of the corporations and their representatives who are noted in the corporate power of attorney. Sometimes corporate powers of attorney can be quite difficult to process for use overseas. If you have a Canadian corporate power of attorney for use overseas, we strongly recommend contacting our office immediately for assistance. International business can be a hectic process. The number one error we see our clients make is waiting until the last minute to contact us. As a general rule of thumb, you should allow at least 2 weeks (10 business days) for the process to be completed from end to end. This means that in most cases it will take around 10 business days before your unprocessed documents are sitting in front of the appropriate authority in the appropriate foreign country. Note that despite our ability to provide the first step of authentication as quickly as the same business day your documents arrive at our office, we cannot influence the processing time at the embassy of the country you need to use your Canadian corporate documents in. Some embassies take 1 day to legalize documents and others can take up to 15 business days or more. As the first provider of this service in Canada, we have served thousands of clients just like you meet their deadlines for their international business dealings. Over the years we have built strong relationships with staff at Global Affairs Canada and at virtually every embassy and consulate in Canada. Our reputation of professionalism and unmatched attention to detail has made us their preferred clientele. In turn this allows us to provide the highest level of service possible in our industry to our clients at a cost which has not changed in over 15 years. Our proud membership with the Canadian Chamber of Commerce, dozens of verified 5-star reviews on Google and Facebook recommendations, and our A+ rating with the BBB make it clear we are the preferred choice for the authentication and legalization service. If you have Canadian corporate documents that you need to use overseas, contact us. Our team is here to answer your questions and address your needs and will keep you updated at every stage of the process. Click below to get started now!